So I’ve been a little more fitness-conscious lately. Recently, my mornings have included a lengthy jog with the dog, followed by an intense at-home cardio program called INSANITY. In an effort to be more aware of what to eat on days that are more active, it has also become a fun exercise into thinking about foods from a different perspective. Normally flavors, smells, visual appeal and comfort are at the forefront if my mind when cooking. In this case, things such as nutritional value, balance, and caloric intake come into play. When it comes down to it, I realize (in general, and sugar aside) that my day-to-day diet is fairly healthy. For instance, this simple salad is something I would normally eat for breakfast, and when look at through “fitness goggles,” it is low-fat, high-protein, rich in vitamins A, B, C, and is a good source of magnesium, potassium, and fiber. Wow, I felt healthier already just writing that! 1. Cook the eggs to a hard-boil. Place the eggs in a small saucepan with enough water to cover them by an inch. Cover, bring to a boil, then turn off heat and let sit for 9-12 minutes (depending on how done you prefer the yolks). 2. 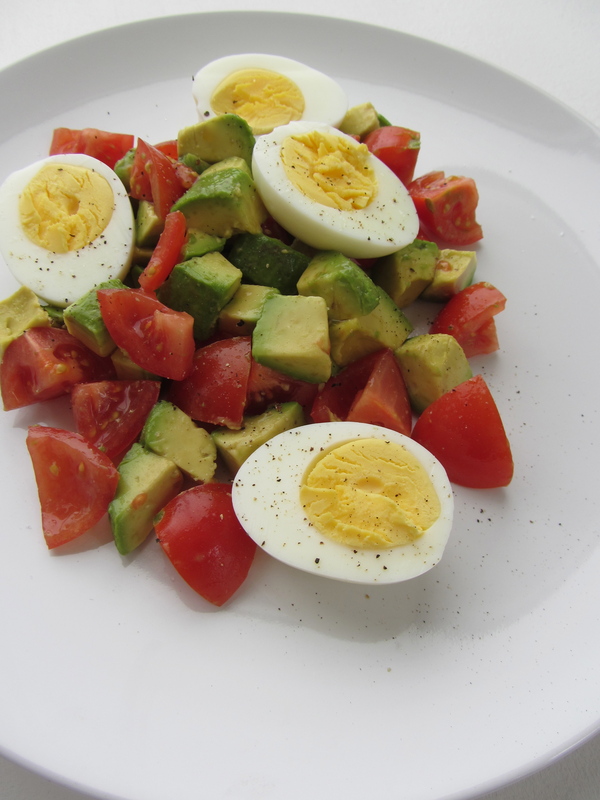 While the eggs are cooking, dice the avocado and tomato. 3. Peel and slice the eggs, serve with the avocado and tomato. Sprinkle lightly with salt and freshly cracked pepper. *No need for dressing. The natural juices of tomato and oils of avocado are a great and balanced pairing. We like to make this recipie and add black beans and an optional protein such as chicken. Delicious!